We are now offering the Wilson Combat/Beretta Brigadier Tactical 92 with a Vertec-grip frame conversion. This conversion, performed by Wilson Combat reduces the size of the frame to the significantly smaller Beretta Vertec size which is ideal for shooters with smaller hands or who prefer the straighter, more 1911 style grip. Some features of the limited production Wilson Combat/Beretta 92G Vertec/Brigadier Tactical include steel ambidextrous decocker-only levers (G model), enhanced Brigadier slide, a modified M9A1 style checkered frame with accessory rail and rounded trigger guard. This model also features enhanced accuracy with an "Elite" style match grade stainless barrel with recessed target crown, the action features a 13lb Chrome Silicone hammer spring for lighter trigger pulls, and Trijicon dovetail tritium front sight and Wilson Combat rear sight. Wilson Combat G-10 grips, Wilson Combat steel guide rod and numerous other features to enhance performance. The 92G Vertec/Brigadier Tactical slide is finished in Beretta black Bruniton with Armor Tuff frame and marked with the Wilson Combat logo and specially serialized to ensure its place in Beretta history. 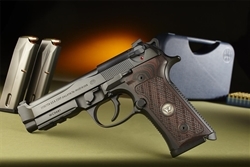 All Wilson Combat exclusive Beretta firearms carry a One-Year Limited Warranty to the original purchaser for defects in materials or workmanship through Beretta USA. Fantastic gun that’s smooth as silk and beautifully finished. Shooters Connection shipping same day as advertised; fantastic!